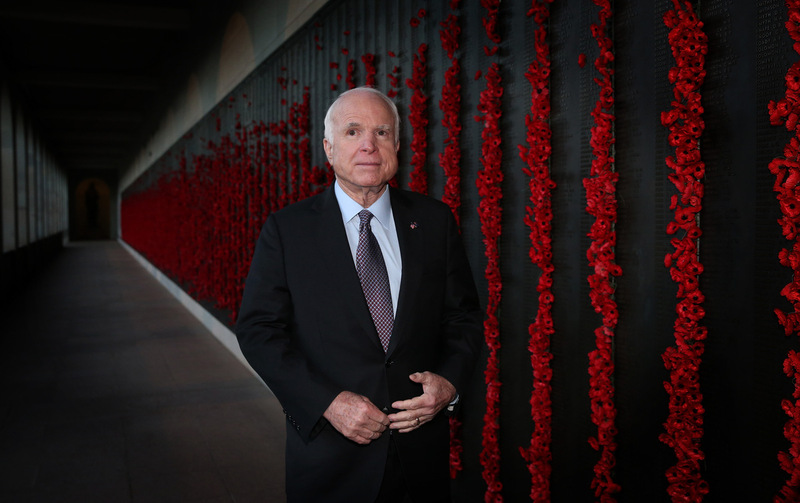 Sen. John McCain Has Been A Pillar Of Washington For Decades. What If He Does Not Return? Outspoken defense hawk. Informal diplomat. Vietnam War hero. The seemingly indestructible McCain has been a pillar of Washington for decades. What could it mean if he does not return? Sen. John McCain's diagnosis of brain cancer could eventually leave the Senate without its irascible military hawk who never holds back. Beltway denizens heading to work on Thursday were forced to contemplate something inevitable but which no one expected anytime soon: the possibility of a Washington without Sen. John McCain. McCain, the irascible old living legend. McCain, the Vietnam War hero. McCain, the globe-trotting State Department of one. McCain, the outspoken hawk who championed American troops — and Pentagon spending — and also pilloried the defense contractors he felt let them all down. McCain, the Senate institution as much a fixture of the capital as the Capitol itself. The 80-year-old Arizona Republican has been diagnosed with brain cancer, his office confirmed late Wednesday, following surgery to remove a blood clot that kept him away from the world's greatest deliberative body — as the Senate is sometimes called — as lawmakers there battled over repealing and replacing the Affordable Care Act. Doctors have determined that McCain is suffering from a tumor known as glioblastoma, according to a statement. A spokeswoman said McCain is in "good spirits" as he rests at home in Arizona following his initial procedure, and he and his family are considering how they'll move ahead with treatment — which may include a combination of chemotherapy and radiation. The encouragement about vanquishing the disease started immediately. McCain "is a dogged ole S.O.B.," tweeted former Rep. John Dingell, who served for almost six decades representing Michigan as a Democrat. "Sharp as hell and tougher than a $2 steak. I look forward to catching up with him soon." Former President George H.W. Bush alluded directly to McCain's nightmarish captivity in Vietnam after McCain's Navy fighter jet was shot down in 1967. "The Hanoi Hilton couldn't break John McCain's spirit many years ago, so Barbara and I know — with confidence — he and his family will meet this latest battle in his singular life of service with courage and determination," the former president said in a statement. McCain's 2008 presidential opponent, Barack Obama, joined in: "John McCain is an American hero & one of the bravest fighters I've ever known," he wrote on Twitter. "Cancer doesn't know what it's up against. Give it hell, John." Even President Trump — who took direct aim at McCain in 2015 by calling him a "loser," the Vietnam War a "disaster" and telling an audience: "I like people who weren't captured" — joined the chorus of encomia on Wednesday night. "Senator John McCain has always been a fighter," Trump said in a statement. But medical groups, including the American Brain Tumor Association, say that patients with McCain's diagnosis seldom live for more than a few years after receiving it. Members of Congress and Senate-watchers on the outside braced themselves for the prospect of McCain never fully returning to Washington in the way it now knows him as he dedicates himself to fighting the disease. That means no freewheeling press conferences or TV appearances with partner-in-crime Sen. Lindsey Graham, R-S.C., a frequent travel companion with McCain on congressional delegations that ranged from Eastern Europe to Southeast Asia. No McCain means no more thunderous stemwinders about what he considered abuses by the big contractors that sell military hardware to the Defense Department — not that he spared himself and his colleagues from criticism, either. In 2011, McCain added his own corollary to President Dwight Eisenhower's warning about the power of the Pentagon and its contractors. McCain warned that the real problem was what he called the "military-industrial-congressional complex." "To be clear, the military-industrial-congressional complex does not cause programs to fail," McCain said from the floor of the Senate. "But it does help create poorly conceived programs, programs that are so fundamentally unsound that they are doomed to be poorly executed. And it does help keep them alive — long after they should have been ended or restructured." All the same, McCain's prescription never was to starve the beast. He mocked Trump's budget proposal that called for increasing defense spending as far too little compared with what he argued the Pentagon actually needs. Trump himself also has been a frequent target: It was McCain who reportedly passed the infamous, unverified dossier about Trump, compiled by a former British intelligence officer, to then-FBI Director James Comey. McCain told reporters that he thought America's international leadership under Obama — which McCain excoriated at the time in blistering terms — still was better than under Trump. And a Washington without McCain means a palpable vacancy at the Senate Armed Services Committee of which he is chairman and on which he has been a mainstay for years. McCain has used his perch to advocate for more, ever more funding each year for the Defense Department, which he argued was left in bad shape after its Iraq War peak in spending. He has a reputation for crankiness, sometimes horsewhipping witnesses — either Pentagon leaders or nominees to join its ranks — if he does not find their answers satisfactory. Last month, McCain lost his patience when Trump's choice to serve as deputy defense secretary, Patrick Shanahan, responded to a question by promising to look into it further. "Mr. Shanahan, you're not making me happy," McCain said. "I'm not going to sit here and watch you duck every question and expect that everything is going to go smoothly. It's not." Before that, McCain terrorized Navy Department witnesses who appeared before the committee to defend their overbudget, long-delayed littoral combat ship program. In December, he raged about a disastrous engineering breakdown aboard the USS Fort Worth that left it stranded at its pier. McCain demanded to know who was responsible. Vice Adm. Thomas Rowden, at the witness table, said that he was. The chairman's colleagues on the Armed Services Committee said late Wednesday that they would be pulling for him as he confronts his cancer treatment. Ranking member Sen. Jack Reed, D-R.I., cited McCain's "indomitable spirit." As senators and staff members prepare for their hearing scheduled for Tuesday about the prospects for building a 355-ship Navy, however, they do so with the knowledge that Chairman McCain might not be there to gavel it into session. Or he might. McCain wrote Thursday on Twitter that Washington hasn't seen the last of him yet. "I greatly appreciate the outpouring of support," he said. "Unfortunately for my sparring partners in Congress, I'll be back soon, so stand-by!